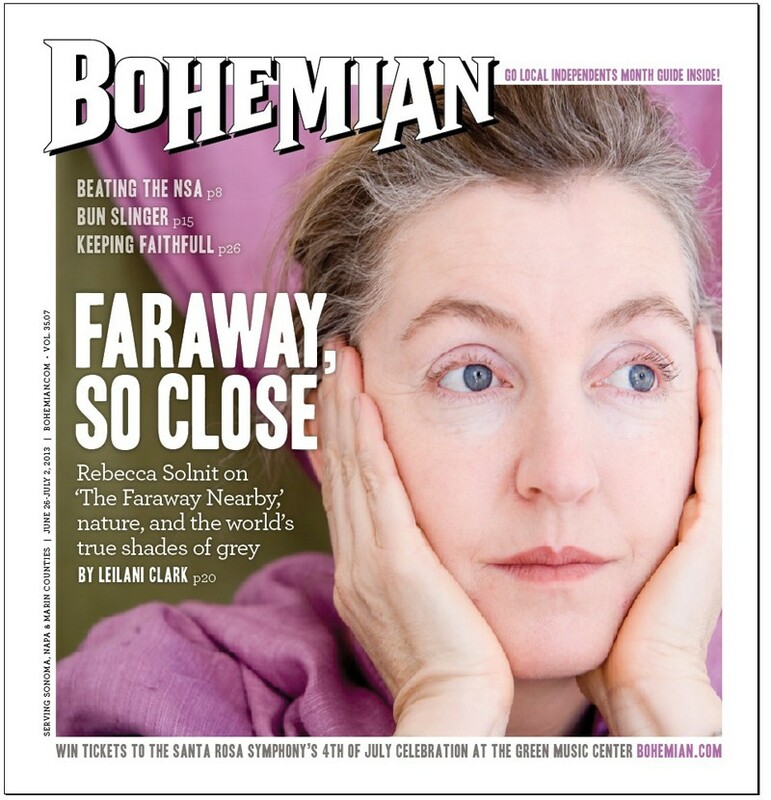 Rebecca Solnit appears in conversation with Michael Lerner on Sunday, June 30, at the New School at Commonweal (451 Mesa Road, Bolinas; 2pm; free with reservation; www.commonweal.org) and in a reading and discussion on Tuesday, July 2, at Copperfield's Books in Petaluma (140 Kentucky St., Petaluma; 7pm; free; 707.762.0563). The National Gallery of Iceland sits at the eastern shore of Tjörnin lake in Reykjavík's city center, overlooking both a modern city hall and the centuries-old Hólavallagardur cemetery. In late June, bright sunlight reflects off the surface of Tjörnin for 21 full hours every day, from 3am to midnight. But in 2008, a young Icelandic artist named Elín Hansdóttir built a labyrinth inside of the National Gallery, almost completely dark within. Path, made up of a series of panels set in a zigzag pattern, offered one person at a time the immersive challenge of finding his or her way back to the beginning. Sometimes, guides would have to go into the darkness and rescue visitors who had lost their bearings. It was an exhibit that San Francisco writer Rebecca Solnit returned to again and again during her months as an international resident at the Library of Water, 70 miles from Iceland's capital, Reykjavík. Solnit looked to the labyrinth as a narrative toolbox for her latest book, The Faraway Nearby, she says over coffee and bread at a cafe on the downtown Sausalito waterfront. "A lot of books have these linear routes, like highways, let's get from here to there," she says. "I wasn't in a rush to get from here to there." 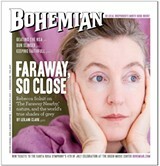 Solnit appears June 30 at the New School and Commonweal in Bolinas and July 2 at Copperfield's Books in Petaluma. A lover of works like Tristram Shandy, the 18th-century novel where the narrator announces he's going to tell his life story and then digresses to such an extent that he's not born until halfway through the book, Solnit set out to create a work of "circuitous routes and byways" in The Faraway Nearby. In one respect, the book tells the story of her mother's descent into Alzheimer's that ended with her death in June 2012, and what Solnit calls her "medical adventure" after pre-cancerous cells were discovered during a routine mammogram. But these are but two threads on a journey that includes Che Guevara, the Snow Queen, Frankenstein's monster, Mary Shelley, cannibalistic polar bears, cannibalistic mothers, Icelandic fjords, mountains of apricots, arctic explorers, Baby Jessica, Charlie Musselwhite, invasive surgery, 2.2-pound babies, leper colonies, Burmese monks and boys named after wolves. "If this was a straight route," Solnit says, "it would be a really boring memoir of about 10,000 words, about: 'My mom was really tricky, I got kind of sick but then I went to Iceland, The End,'—which is not that interesting to me, and I don't think it would be that interesting to other people." In fact, the British edition of The Faraway Nearby has been given a hyphenated genre: "memoir/anti-memoir." It's a proposal that came directly from Solnit as part of her desire to articulate a "different sense of self." "The version of self we've been given, in some ways, by psychology and therapy—that sort of post-40 thing—it feels really reduced to me," Solnit explains. "The relationship to the earth itself gives you this depth and breadth and height and range. It gives you a kind of vastness; and then personal is right in the middle of it, and I absolutely value it and it absolutely matters, but to me, it's like home. You come back to it. You're not an agoraphobic who never leaves it."